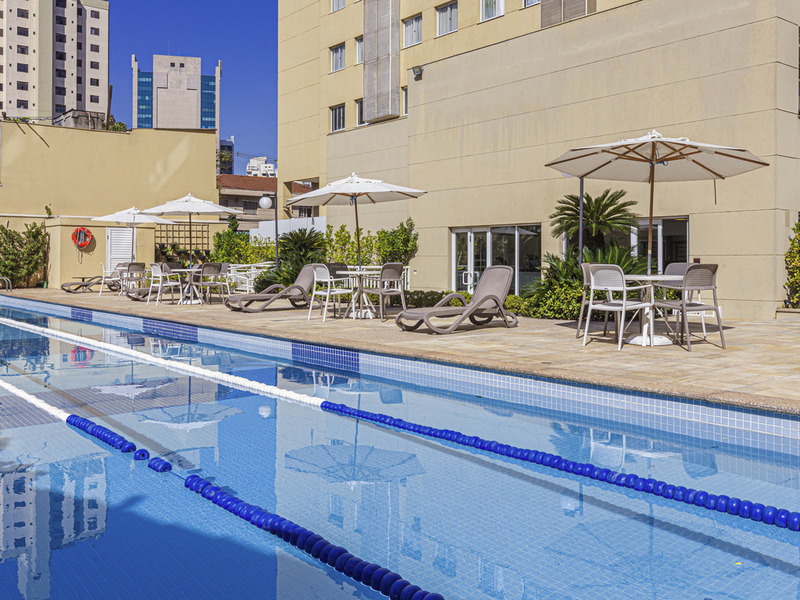 The Mercure São Paulo Vila Olímpia hotel is located in the Vila Olímpia neighborhood, in an area filled with restaurants, bars and shops. It is located on Rua João Cachoeira, near Avenida Santo Amaro, Congonhas Airport, Ibirapuera Park, Eataly and the Vil a Olímpia and JK shopping centers. Check out our semi-Olympic size swimming pool, fitness center, dry and steam saunas, beauty salon and the Le Club zen space. The hotel has a floor for events and an innovative co-working room. Free transfers and WIFI. Ibirapuera Park, the Obelisk, Ipiranga Museum, shopping centers, cinemas, theaters, bars and restaurants are justs some of the places waiting for you to visit. The hotel's employees are there to advise you on where to visit in São Paulo. Wellness area with a pool, fitness center, sauna and beauty salon. All our rooms are comfortable and feature laminate flooring, a desk, 32" LCD TV, safe and hair dryer. We offer four apartment categories and our exclusive Privilege room features special facilities. The casual nature of La Forchetta's architecture offers a more welcoming environment. The house is still furnished with outdoor tables and a vegetable garden that is used by the kitchen. The à la carte option serves Italian cuisine with a Brazilian touch. the wi fi wasn't work very well/ Towes were not availabe on the room and i had to request the reception/the brekfast table didn't have enough space. The customer service was great and also breakfast. However, the toilet was loose, the ventilation in the bathroom did not work, and the water (in the sink) got stuck for a while. People in the front desk was really indifferent and not committed to find a solution to offer me a room for the entire week, since i had an issue with my reservation (my travel agency did a mistake regarding the dates) which ended up in a no-show. I stayed only 01 night at your hotel, out of 7 that I was planning to stay in Sao Paulo. The room they offered me for this 01 night was a single bed, I asked to the lady in the reception to change for a double bed, she said that it was not possible but that she would ask to put the 02 single bed together.When I returned at night the room was exactly in the same way, with 02 separated beds. When I decided to talk with another employee in the reception he found a double bed room quickly, what makes me wonder that the other employee was really uncommitted to help me out. The worst experience ever! Last time I stayed at Mercure hotel in Sao Paulo. That said, I needed to find another hotel from your competition, where I spent the rest of the week with better service level, proper trained staff, attentive employees. From now on, this will be my preferred option of hotel for my next trips. Great job from your employee...you lost a guest! Very attentive and courteous staff at a good location. I really enjoy staying here when in Sao Paulo for weeks at a time. I feel at home. I do a lot of work in my room when not visiting Clients and everything works well. The restaurant has good food for lunch or hosting a meeting. I will be back next week. I stayed at the Hotel for five nights. It was ok, by breakfast was always crowded and the points of my stay weren’t credited in my account. Dear Henrique. Thank you for choosing Mercure Vila Olímpia. We have checked about your fidelity points, so at soon it will be credit in your account. We hope to see you soon again. Wayner Deputy manager. Clean and comfortable, however it is under a flightpath and flights begin at 06.00 which are quite loud depending on which side of the hotel your room is located. I think that what made me fell more cozy and welcomed were the staff, since check in, hotel maid, guest relations. And of course, the building, it's modern, clean, spacious. The breakfast is delicious, has a great variety of food and all the time has a staff member to help you e give you home fresh made &quot;pão de queijo&quot;. The hotel is nice, but definetely it is not a family hotel. NO rooms for entertainment, small rooms. The playground is outside so when it rains you cannot use it. Again, this is not a critic to the hotel, but to its category of family hotel. the attention is really good, staff is really nice and everything is clean. Regular breakfast. The hotel facilities are good, and the neighborhood is great. Overall staff attention was good. HOWEVER, I was extremely disappointed when I asked for ONE HOUR extension on my check-out and had it denied. The hotel was not fully booked. More astonishing, I was handled by the Ambassador Le Club, the very person that should take special care of my needs and requests. Having been a Platinum member for quite some years, I am used to feel unique in getting good attention from Accor staff. This was not the case here. The said lady (Amanda Souza) was nice and polite, but not prepared to handle requests from premium guests. She did not move one single finger to try to help me with my need. I wonder how could the hotel management appoint such an unprepared person to this Ambassador position. As I said, I liked the hotel and the neighborhood, and hope to go there again. And sure hope to get more of a premium treatment than I have had. We had 3 days of stay in Mercure Vila Olimpia. Two things to point out: 1- The bathroom should have shower haddress for womem. 2- I asked a &quot;tapioca&quot; in the breakfast but it came withought any filling, only the powder. That was a terrible experiencie. The breakfast options in the buffet were fine at all. Great service, rooms very small and need upgrading, food should improve, excellent bar and service. The staff was very pleasant and the room was nice! Considering the fact that yours is a business hotel, not many of the employees (including the reception staff!) could communicate in English language. Similar problem was encountered in communication at the restaurant and house keeping. This should be looked into and improved upon - atleast some of the hotel staff should be well verse with English language.